Venous insufficiency resulting from superficial reflux because of varicose veins is a serious problem that usually progresses inexorably if left untreated. When the refluxing circuit involves failure of the primary valves at the saphenofemoral junction, treatment options for the patient are limited, and early recurrences are the rule rather than the exception. See Superficial Venous Insufficiency: Varicose Veins and Venous Ulcers, a Critical Images slideshow, to help identify the common risk factors and features of this condition and its management options. In the historical surgical approach, ligation and division of the saphenous trunk and all proximal tributaries are followed either by stripping of the vein or by avulsion phlebectomy. Proximal ligation requires a substantial incision at the groin crease. Stripping of the vein requires additional incisions at the knee or below and is associated with a high incidence of minor surgical complications. Avulsion phlebectomy requires multiple 2- to 3-mm incisions along the course of the vein and can cause damage to adjacent nerves and lymphatic vessels. Endovenous ablation has replaced stripping and ligation as the technique for elimination of saphenous vein reflux. One of the endovenous techniques is a radiofrequency-based procedure. Newer methods of delivery of radiofrequency were introduced in 2007. Endovenous procedures are far less invasive than surgery and have lower complication rates. The procedure is well tolerated by patients, and it produces good cosmetic results. Excellent clinical results are seen at 4-5 years, and the long-term efficacy of the procedure is now known with 10 years of experience. [1, 2, 3, 4, 5] The original radiofrequency endovenous procedure was cleared by the US Food and Drug Administration (FDA) in March 1999. The original radiofrequency endovenous ablation system worked by thermal destruction of venous tissues using electrical energy passing through tissue in the form of high-frequency alternating current. This current was converted into heat, which causes irreversible localized tissue damage. Radiofrequency energy is delivered through a special catheter with deployable electrodes at the tip; the electrodes touch the vein walls and deliver energy directly into the tissues without coagulating blood. The newest system, called ClosureFast, delivers infrared energy to vein walls by directly heating a catheter tip with radiofrequency energy. In the original radiofrequency catheter system, the catheter was pulled through the vein while feedback is controlled with a thermocouple to a temperature of 85°C to avoid thermal injury to the surrounding tissues or carbonization of the vein wall. With the new system, the catheter is held in place while energy heats the catheter to a specified temperature of 120ºC. As the vein is denatured by heat, it contracts around the catheter. With the previous-generation radiofrequency system, as shrinkage and compaction of tissue occurred, impedance was decreased which decreased heat generation; however, this is no longer the case. Only the temperature of the catheter metal core is monitored as it delivers heat to the vessel wall in 20-second increments. Previously, the radiofrequency generator could be programmed to rapidly shutdown when impedance rose, thus assuring minimal heating of blood but efficient heating of the vein wall. In the present system, catheter core temperature is monitored and adjusts energy to keep the core at 120 º C. Heat delivered to the vein wall causes the vessel to shrink in the treated area, and the catheter is gradually withdrawn along the course of the vein until the entire vessel has been treated. This is performed in 7-cm segments. The image below demonstrates a schematic diagram of the process. 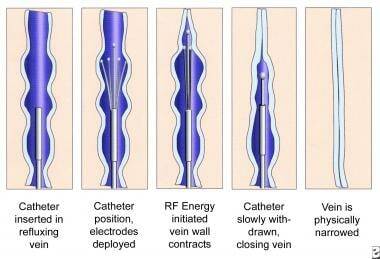 Schematic images of the process of radiofrequency endovenous occlusion. Many different radiofrequency ablation catheters are available for medical applications, but the Closure catheter, manufactured by VNUS Medical Technologies, is the only commercially available radiofrequency ablation system designed for venous ablation. The image below shows the Closure console, and the second image below shows 2 sizes of radiofrequency ablation catheters. 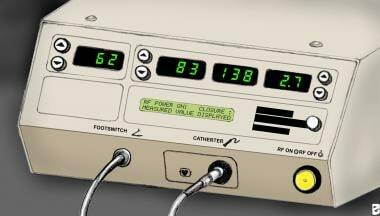 Radiofrequency ablation console (VNUS Medical Technologies) showing (left to right) time, temperature, impedance, and power (in watts). 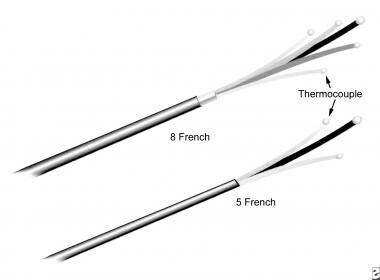 Closure radiofrequency ablation catheters in 2 sizes (VNUS Medical Technologies). Immediately after treatment, biopsy specimens show a significant reduction in the size of the vein lumen, with denudation of endothelium, thrombus formation, thickened vessel walls, loss of collagen birefringence, and inflammatory changes. The zone of thermal damage is limited to 2 mm beyond the point of contact with the electrodes. In more than 90% of patients, biopsy specimens demonstrate complete occlusion of the vein lumen 6 weeks after treatment. The lumen is completely ablated in most areas, with some portions of the vessel demonstrating a small residual lumen containing organized fibrous thrombi. Birefringence is present, and new collagen growth is evident. Radiofrequency ablation catheters cannot be easily passed along a tortuous superficial vein; therefore, the procedure is principally of use in the treatment of truncal varicose veins, such as the great saphenous vein. Radiofrequency ablation is also used with small saphenous vein incompetence. Duplex ultrasonography is used to confirm and map all areas of reflux and to trace the path of the refluxing great saphenous trunk from the saphenofemoral junction down the leg to the lower thigh or upper part of the calf. The vein, the saphenofemoral junction, and the anticipated entry point are marked in some way on the skin. An appropriate entry point is selected just above or just below the knee, at a point permitting cannulation of the vessel with a 16-gauge needle introducer. The leg is prepared and draped, and a superficial local anesthetic agent is used to anesthetize the site of cannulation. Needle puncture of the vessel is guided by duplex ultrasonography. The Seldinger technique is used to place a guidewire into the vessel, and an introducer sheath is passed over the guidewire, which is removed. The ClosureFast catheter is passed through the sheath, and the tip is advanced to 2 cm below the saphenofemoral junction under duplex ultrasonographic visualization. With ultrasonographic guidance, a local anesthetic agent is injected into the tissues surrounding the great saphenous vein above and within its fascial sheath. The anesthetic is injected along the entire course of the vein from the catheter insertion point to the saphenofemoral junction. In most patients, 200-400 mL of lidocaine 0.1% is sufficient to both anesthetize and compress the vessel. Note the importance of delivering the anesthetic agent in the correct intrafascial location, with a volume sufficient to compress the vein and dissect it away from other structures, such as nerves, along its entire length. Duplex ultrasonography is used to position the catheter tip 2 cm below the level of the terminal valve of the saphenofemoral junction. The catheter must not extend into the femoral vein because injury to the femoral vein may cause deep vein thrombosis. In the previous radiofrequency ablation system, when the console is switched on and the test mode is activated, the baseline impedance should be 250-300 ohms and the baseline temperature should be 32-37°C. When radiofrequency energy is applied, the thermocouple temperature should rise to 80-85°C within 10-15 seconds. In the new system, when the radiofrequency is activated, the catheter core temperature should rapidly rise to 120ºC and should be sustained for 15 seconds of the 20-second pulse cycle. If the temperature does not rise quickly, a malpositioned catheter tip should be strongly suspected. In the previous system, after the temperature reaches 85°C and remains constant for 15 seconds, the catheter tip is slowly withdrawn at a rate of approximately 1 cm per minute (1 mm every 6 seconds). In the new system, two 20-second cycles are performed in the proximal section, after which the catheter is withdrawn 7 cm as per catheter markings. The next 20-second cycle is repeated once, and, if 120ºC is maintained, the catheter is then withdrawn another 7 cm until the entire vein is treated. When proper tumescent anesthesia is applied, the patient should never experience a sudden heat sensation. If this happens, more anesthesia is injected. Posttreatment duplex ultrasonography confirms the contraction of the vessel and the absence of flow along the entire length of the treated vessel. In the previous system, if persistent flow is observed, the procedure may be repeated immediately, provided the catheter can still be easily passed along the vessel to the desired site of treatment. In the new system of ClosureFast, the procedure is not repeated because the targeted vessel typically shows no flow. Compression is of vital importance after any venous procedure. Compression is effective in reducing postoperative bruising and tenderness, and it can also reduce the risk of venous thromboembolism in both the treated leg and the untreated leg. A class II (30- to 40-mm Hg gradient) compression stocking is applied to the treated leg, and, if the patient is willing, it is also applied to the untreated leg. Bed rest and lifting of heavy objects are forbidden, and normal activity is encouraged. The patient is reevaluated 3-7 days after the operation, at which time duplex ultrasonography should demonstrate a closed great saphenous vein and no evidence of thrombus in the femoral, popliteal, or deep veins of the calf. At 6 weeks, an examination should reveal clinical resolution of truncal varices, and an ultrasonographic evaluation should demonstrate a completely closed vessel and no remaining reflux. If any residual open segments are noted, sclerotherapy is performed under ultrasonographic guidance. For patient education resources, see Varicose Veins. Published results show a high early success rate with a very low subsequent recurrence rate up to 10 years after treatment. Early and mid range results are comparable to those obtained with other endovenous ablation techniques. The authors’ overall experience has been a 90% success rate, with rare patients requiring a repeat procedure in 6-12 months. Overall efficacy and lower morbidity have resulted in endovenous ablation techniques replacing surgical stripping. Patient satisfaction is high and downtime is minimal, with 95% of patients reporting they would recommend the procedure to a friend. It was also found that a higher rate of recanalization occurred with radiofrequency ablation than with the laser procedure. Sadick NS. Advances in the treatment of varicose veins: ambulatory phlebectomy, foam sclerotherapy, endovascular laser, and radiofrequency closure. Dermatol Clin. 2005 Jul. 23(3):443-55, vi. [Medline]. Merchant RF, Pichot O, Myers KA. Four-year follow-up on endovascular radiofrequency obliteration of great saphenous reflux. Dermatol Surg. 2005 Feb. 31(2):129-34. [Medline]. Nicolini P. Treatment of primary varicose veins by endovenous obliteration with the VNUS closure system: results of a prospective multicentre study. Eur J Vasc Endovasc Surg. 2005 Apr. 29(4):433-9. [Medline]. Helmy ElKaffas K, ElKashef O, ElBaz W. Great saphenous vein radiofrequency ablation versus standard stripping in the management of primary varicose veins-a randomized clinical trial. Angiology. 2011 Jan. 62(1):49-54. [Medline]. Subramonia S, Lees T. Radiofrequency ablation vs conventional surgery for varicose veins - a comparison of treatment costs in a randomised trial. Eur J Vasc Endovasc Surg. 2010 Jan. 39(1):104-11. [Medline]. Nael R, Rathbun S. Treatment of varicose veins. Curr Treat Options Cardiovasc Med. 2009 Apr. 11(2):91-103. [Medline]. Nijsten T, van den Bos RR, Goldman MP, et al. Minimally invasive techniques in the treatment of saphenous varicose veins. J Am Acad Dermatol. 2009 Jan. 60(1):110-9. [Medline]. Morrison N. Saphenous ablation: what are the choices, laser or RF energy. Semin Vasc Surg. 2005 Mar. 18(1):15-8. [Medline]. Leopardi D, Hoggan BL, Fitridge RA, Woodruff PW, Maddern GJ. Systematic review of treatments for varicose veins. Ann Vasc Surg. 2009 Mar. 23(2):264-76. [Medline]. Hingorani AP, Ascher E, Markevich N, et al. Deep venous thrombosis after radiofrequency ablation of greater saphenous vein: a word of caution. J Vasc Surg. 2004 Sep. 40(3):500-4. [Medline]. Shepherd AC, Gohel MS, Lim CS, Hamish M, Davies AH. Pain following 980-nm endovenous laser ablation and segmental radiofrequency ablation for varicose veins: a prospective observational study. Vasc Endovascular Surg. 2010 Apr. 44(3):212-6. [Medline]. Rudarakanchana N, Berland TL, Chasin C, Sadek M, Kabnick LS. Arteriovenous fistula after endovenous ablation for varicose veins. J Vasc Surg. 2012 May. 55(5):1492-4. [Medline]. Tamura K, Maruyama T. Mid-Term Report on the Safety and Effectiveness of Endovenous Radiofrequency Ablation for Varicose Veins. Ann Vasc Dis. 2017 Dec 25. 10 (4):398-401. [Medline]. [Full Text]. Proebstle TM, Alm BJ, Gockeritz O, et al. Five-year results from the prospective European multicentre cohort study on radiofrequency segmental thermal ablation for incompetent great saphenous veins. Br J Surg. 2015 Feb. 102 (3):212-8. [Medline]. [Full Text]. Bush RG, Bush P, Flanagan J, et al. Factors associated with recurrence of varicose veins after thermal ablation: results of the recurrent veins after thermal ablation study. ScientificWorldJournal. 2014. 2014:505843. [Medline]. [Full Text]. Bozoglan O, Mese B, Eroglu E, et al. Comparison of Endovenous Laser and Radiofrequency Ablation in Treating Varicose Veins in the Same Patient. Vasc Endovascular Surg. 2016 Jan 14. [Medline]. Hwang JH, Park SW, Chang IS, Kim KH, Kang JH. Endovenous Thermal Ablation of Recurrent Varicose Veins due to Residual Great Saphenous Venous Insufficiency After Saphenous Venous Surgery: A Comparative Study. Dermatol Surg. 2018 May 16. [Medline]. Ahadiat O, Higgins S, Ly A, Nazemi A, Wysong A. Review of Endovenous Thermal Ablation of the Great Saphenous Vein: Endovenous Laser Therapy Versus Radiofrequency Ablation. Dermatol Surg. 2018 May. 44 (5):679-88. [Medline]. Disclosure: Received honoraria from Angiodynamics for speaking and teaching; Received intellectual property rights from CoolTouch Corp for consulting; Received grant/research funds from Cynosure for independent contractor; Received grant/research funds from Palomar for independent contractor. Disclosure: Serve(d) as a director, officer, partner, employee, advisor, consultant or trustee for: QualDerm Partners; Novascan<br/>Have a 5% or greater equity interest in: QualDerm Partners - North Carolina.